Abbotts Hotel Waterloo has quietly unveiled a renovation and foodie drawcard owner Bill Smith has aimed at the “sweet spot” for pubs, in the moving target of patron expectations. 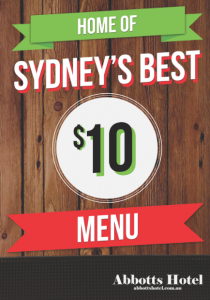 The relentless march of the foodie to re-invented gastro pubs has become almost militaristic in the fringes of Sydney, as revellers rejoice in sensibly priced meals that rival top-dollar morsels at expensive restaurants. While the standard of food has risen dramatically, Smith says the fundamentals of what makes a good pub haven’t changed too much. Boldly facing the tide of change, the hotel has morphed from being a predominantly beer pub to a neighbourhood pub, enjoying the company of young and old locals, inner-city hipsters and the traditional clients in an all-welcome atmosphere.